The EU is not going to write off the external debt of Greece, as the country should abide by the previous commitments to its international lenders, said the President of the European Commission Jean-Claude Juncker. "There is no question of cancelling the Greek debt. Other eurozone countries will not accept this," said Juncker Wednesday as quoted by Le Figaro. He added that Brussels is open to dialogue and didn’t want to threaten Greece. The Greek government was forced to implement austerity measures in exchange for a €317 billion bailout from the troika of creditors of the ECB, IMF and the EU. Most of the funds were used to support Greek banks and only around 10 percent has reached the people. Tightening belts resulted in a sharp increase in poverty and a record high unemployment rate. During the election campaign the new party in power Syriza pledged to enact anti-austerity measures that included writing off part of the ‘troika’ debt. The refusal to pay off the debt to international creditors will question the further membership of Greece in the eurozone. 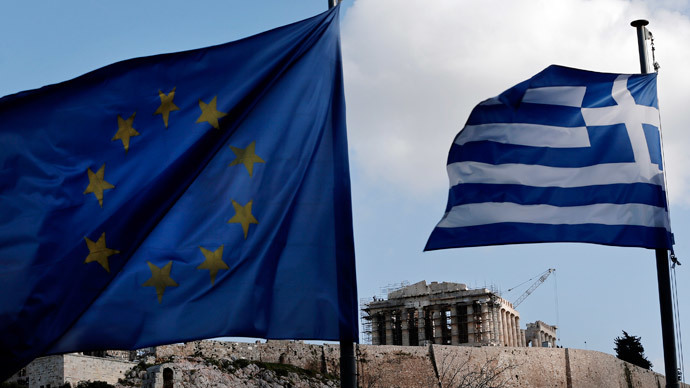 Experts and economists fear that radical decisions taken by Syriza could lead to Greece exiting the eurozone which in turn could trigger a domino effect with other countries in the region hard hit by the crisis. On Monday Mr. Juncker had a phone conversation with the new Greek Prime Minister Alexis Tsipras whose campaign pledge was to give Greece an anti-crisis plan alternative to austerity. "He told me that he doesn't consider himself a danger, but a challenge for Europe. And I replied that Europe is not a danger for Greece, but a challenge," Juncker told Le Figaro. He explained that the results of the parliamentary elections in Greece, won by the left-wing Syriza party, will not change the situation radically. "It won’t be true if we say a new world was born after the elections. We respect the right of Greece to choose, but Greece has to respect others, to respect public opinion and members of parliament of other European countries. Various agreements are possible, but they will not fundamentally change what's already there," said Juncker. Juncker’s statement followed the reaction of Germany, Greece’s biggest lender, which said it won’t consider writing off the country’s debt. "Greece cannot simply pick and choose what it does and does not want to do and expect its neighbors to step into the breach," insisted Sigmar Gabriel, German Vice-Chancellor and Minister of Economy and Energy. At the same time, Berlin doesn’t exclude that the program of financial aid to Athens can be extended. However, such a decision will be taken at the EU level. On Sunday opposition party Syriza came to power in Greece as a result of early elections. Its leader, Alexis Tsipras, became prime minister and said he would fight to write off the country’s external debt to the European Union. "We are ready for talks with EU partners to find a viable, fair and mutually beneficial solution to the debt problem," he said adding there won’t be a “catastrophic break” with Brussels but at the same time Athens is not going to continue, "the destructive policy of subordination." Tsipras has already suspended the privatization of ports and the sale of national energy providers agreed as part of the bailout terms. He has announced a hike in pensions for the poor and is also planning to return to work some public sector workers laid off amid the austerity measures imposed by the previous government. Greek bank stocks have fallen over 40 percent since the elections on Sunday, with a drop of 26 percent after the announcements of the new policies on Wednesday. The program of financial aid to Greece was supposed to end in December, but was extended for another two months so that the country could run the elections and the terms of exit could be negotiated with the new government.